Different multivitamin formulas have different dosing instructions. Unless your doctor specifically tells you something else, always follow the section “Directions for Use” on your multivitamin package, as it varies pretty widely. Some multis are taken once per day with a meal while others may require you to take two capsules twice a day! We’ve made it easy to get the nutrients you need in a single daily dose. 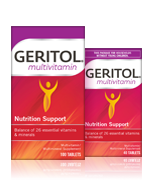 One Geritol® multivitamin tablet provides both men and women with all 13 essential vitamins, plus 13 minerals! Because Geritol® contains fat-soluble vitamins A, D, E, and K, which can build up in the system if too much is taken, we do not recommend taking more than one tablet per day. Vitamins and minerals are powerful substances and can have potentially toxic effects when taken in excess quantities. More information about the negative effects of taking too much of a vitamin. More than one tablet a day is unnecessary unless you have an unusual nutritional deficiency. In that case, you should consult your physician.